The photographer, along with health activists and Harvard medical students, organized a die-in in the atrium outside the Arthur M. Sackler Museum in Cambridge, MA. On Friday, July 20, artists, activists, and medical professionals crowded the Harvard Art Museums atrium for a protest and die-in organized by the group P.A.I.N. Sackler. The organization seeks to pressure Purdue Pharmaceuticals, owned by the descendants of Mortimer and Raymond Sackler, manufacturers of popular prescription drug Oxycontin, to take responsibility for their part in the opioid addiction endemic. P.A.I.N. (Prescription Addiction Intervention Now) was spearheaded by Nan Goldin, the renowned photographer best known for her collection of photographs that became The Ballad of Sexual Dependency. After heroin use during her young adulthood, in 2014 she formed a three-year OxyContin addiction “overnight” after being prescribed the drug following surgery. The artist says she was not properly informed by physicians of the strong addictive quality of the drug. A survey published by the Centers for Disease Control and Prevention and National Vital Statistics System says that opioid overdose kills over 115 people in the United States daily. The group has been targeting the Sackler family’s philanthropic efforts within art institutions. 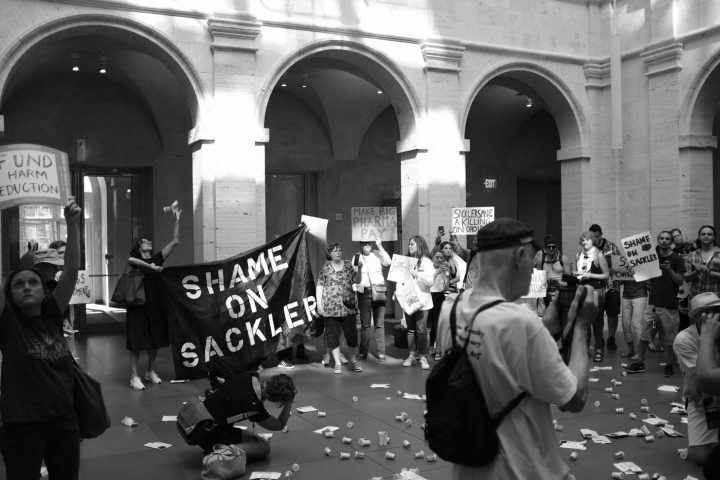 In a statement via their website, they explain their mission, “[The Sacklers] have washed their blood money through the halls of museums and universities around the world. We demand that the Sacklers and Purdue Pharma use their fortune to fund addiction treatment and education. There is no time to waste.” The Harvard Art Museums consists of three art museums, including the Arthur M. Sackler Museum. The organization hosted over 70 protesters at a die-in demonstration last Friday. The protest operated with support from organizations like VOCAL NY, the Center for Popular Democracy, and the Harm Reduction Coalition. 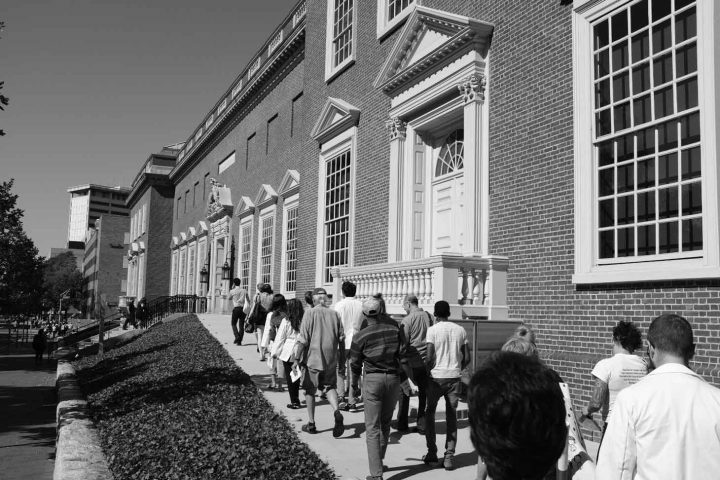 The group marched from Harvard Square to the atrium of the Harvard Art Museums building, which hosts the Fogg Museum, Busch-Reisinger Museum, and Arthur M. Sackler Museum. Participants threw Oxycontin and Narcan (a narcotics overdose prescription medication) containers across the floor of the atrium, chanting protests like “Sacklers lie! People die! Fund harm reduction now!” Hyperallergic reached out to the Harvard Art Museums and a representative of the institution declined to comment. P.A.I.N. calls for the Sacklers to stop funding museums, and divert these funds to help reverse and heal the opioid addiction epidemic. They compel the mega-company to redirect at least half of their profits to treatment facilities (rehabilitation centers, harm reduction, relapse prevention); educational programs for schools, medical professionals, families, and drug users; and re-education across the boards to inform physicians of the hazards of over-prescription. In a statement sent to Hyperallergic, Purdue Pharmaceuticals says, “We share Ms. Goldin and P.A.I.N.’s concerns about the prescription and illicit opioid abuse crisis, and we are committed to being part of the solution.” They say they ended their Oxycontin promotional speaker program in late 2016 and their sales force engagement with prescribers for all of its medicines in recent weeks, with a new initiative on Corporate Social Responsibility, created in March 2018. In the past, P.A.I.N. has hosted protests in the Sackler Wing of the Metropolitan Museum of Art, throwing prescription bottles in the moat around the Temple of Dendur, and at the Sackler Gallery in Washington, DC. P.A.I.N. has been openly supported by Elizabeth Sackler, the daughter of Arthur Sackler and the founder of the Elizabeth A. Sackler Center for Feminist Art at the Brooklyn Museum. Speaking to Hyperallergic in January, her foundation representatives clearly stated that she is no longer associated with Purdue Pharma after her father’s shares were sold to his brothers Mortimer and Raymond Sackler in 1987. Hyperallergic’s numerous requests for comment from the P.A.I.N. Sackler group were unanswered.